Storage systems for residential and commercial photovoltaic installations are another trend reflected in Delta’s product portfolio on display at Intersolar Europe 2018. The company’s ES30 and Hybrid E5, for instance, lower costs for residential and commercial operators by increasing the amount of solar power a facility or residence can consume itself instead of feeding it into the grid. Another industry-wide trend Delta is helping to define is smart energy management enabled by technologies such as integrated connectivity. The Hybrid E5 energy storage system, for instance, combines an E5 hybrid inverter with an external 6kWh lithium-ion battery, power meter, and a smart monitor. Rounding out the Delta exhibition is its latest power conditioning products, which improve the quality of the solar power supplied to electrical equipment. Technical highlights of the Delta technologies on display are listed below. Delta’s new flagship inverter model, the 3-phase M125HV series, offers a maximum of 125kVA output power, active cooling, and industry-leading peak efficiencies of up to 99%. These high-power and high-efficiency string inverters are ideal for maximizing the return on investment from large commercial and ground-mounted photovoltaic plants with megawatt-sized solar arrays. With its new Flex series, Delta is offering 4kVA and 5kVA single-phase string inverters for residential applications. The new models have the same compact dimensions as their predecessor, the H3 Flex 3kVA, yet at considerably higher power densities. Integrated wireless communications allow for remote commissioning and monitoring using the MyDeltaSolar app, which is available for Android and iOS mobile devices. Commercial photovoltaic systems use Delta ES30 battery storage systems for peak-shaving and peak-shifting to limit feed-in power to the grid and maximize the portion of their PV power generation that they consume themselves to lower electricity costs. 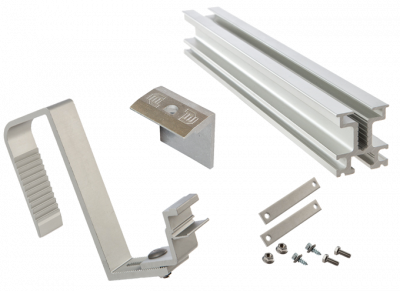 ES30 systems also stabilize grid voltage and can be installed in parallel for modular expansion. 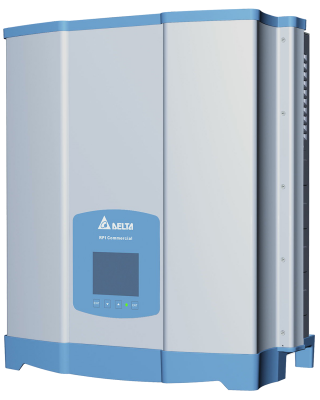 The Hybrid E5 energy storage system consists of an E5 hybrid inverter in combination with an external cabinet equipped with a 6kWh Li-ion battery module, a power meter, and a smart monitor. The Hybrid E5 boasts high DC charging efficiencies of up to 95% between the PV array and the battery.